My experience from the 2015 and 2017 tours is that a select few fans manipulated the system to allow themselves prime positions in line without actually having to wait in line, going against previously announced venue rules, which put the majority of fans at a disadvantage. Generally, the venue will set a rule saying that people are not allowed to begin lining up before a set time. What then happens is that a select few fans decide that this rule doesn't apply to them, and start their own line, often not at the actual venue. Then, they show up at the time the venue says the line is allowed to begin, and demand that they be counted ahead of everyone who actually showed up at the time the venue said people were supposed to show up. These people even got violent at the Boston/Foxboro show in 2017. They had been told by the venue that they couldn't line up the night before and that their list wouldn't be honored. They had to be physically removed from the property. And yet, they decided that the line would begin at a Dunkin Donuts and that they deserved to be ahead of everyone who did honor the venue rules, and created a scene in an attempt to get things their way. These select few people will also start a list, and claim that because their name is written there, that they're actually ahead of you in line. Now, I have absolutely no trouble with the idea of writing down the order that people arrive in, and allowing people to leave the line temporarily to use a restroom or to pick up a sandwich to bring back to the line. I think that's just the decent thing to do. But the "list people" will show up at the venue the night before, put their name on a list, and then go home. Then, they'll come back in the morning, and say that since they were there for five minutes the night before, that they deserve to be in front of everyone who actually did wait overnight. I sincerely hope that U2's management will do something to curb this behavior in 2018. I have to say, the behavior of those select few fans in 2015 and 2017 really took away a lot of joy from something that had previously brought me so much happiness for so many different tours over so many years. I think the Bruce Springsteen "lottery" method is a great way to combat this. You show up between 2pm and 5pm to get a numbered wristband. At 5pm, a random drawing is held, and the number selected is where the line will begin. So, if 300 wristbands end up being given out, and #50 is drawn, then the person who has #50 becomes the head of the line and the line goes from #50-300, and then #1 goes in after #300, and then everyone who shows up after the wristband drawing goes after them. It puts control of the situation in the hands of venue and band security, where it belongs, and it keeps things much more orderly. Everyone who shows up early enough to get a wristband gets in ahead of those who don't, but it also keeps people from waiting overnight as it doesn't get you any advantage. The overnight queues tend to favor wealthier fans who travel from city to city and book a hotel in walking distance from the venue, while putting local fans who have to drive to the venue or have to work at a disadvantage. During these crazy and very hectic pre-sale times, I would like to thank all the mods for their relentless effort to answer our questions, listen to complaints, help people find their way through the various steps and websites, ... Really guys, I wouldn't want to pay a euro per time that you’ve had to re-direct to the faq page, or say album presale is different, or ‘2 tickets for 1 show’, or ‘check your profile for the code’, or .... So Max, Bigwave and Mich ... THANK YOU!!! You’re the best! Lifelong fan and I can’t stop with the new songs. All of them are very solid. Blackout is fantastic so is Get out of your own way into American Soul. Put in the amazing The Little Things That Give You Away and this could be one of their best which is incredible after all these years. And from a live show perspective these will all sound really good live. Especially Blackout. I am so thankful U2 doesn't do this. I think my feelings toward them would change if they commercialized and profited off fans' desires to meet them. They have always talked about how they know that they owe their privileged lives to the fans who have been there for them year after year, and I just think it would feel icky. One of the things I love so much about these four men is that they sure don't have to, but they often stop their vehicles on the way in to soundcheck and come out and shake hands, sign things, and pose for pictures. And I have never in my life heard of a fan running into them anywhere and encountering any rudeness. 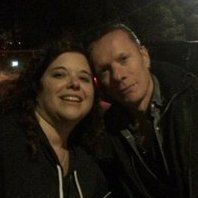 I have been lucky and have met Edge twice, Larry once, and Adam once (kind of twice, as he went around the crowd and then came back to me a second time and posed for the picture that is my profile pic here), all outside gigs. I've made eye contact with and waved to Bono and shouted "I love you!" to him, a few feet away, LOL. So...I can't even think about paying to do a meet and greet. Any honest opinion is obviously legitimate , but one aspect of this album which I think is undeniable, is that it is an incredibly thoughtful album. It's incredibly honest, nuanced in some metaphorical mis-directions and I suspect, likely written quickly. Someone else here mentioned it seemed rushed. I think there is immense difference in rushing or pushing something out and being deeply inspired. If you experienced those moments, you know how the words, actions, art...whatever it might be, just 'write' themselves. This is an age 50 something- WAR There is such anguish and despair. There is hope, but its not naïve and may not be optimism per se. Just hope or a personal prayer possibly. It exists but isn't a guaranteed save. We all know the U2 character - esp Bono's, well enough after all these years to appreciate, the man has such deep soul and empathy - and evidently, is a tough enough dude to just go after those people or situations that cause so much harm. I am loving it now. I didn't initially. But in knowing where these tunes come from and not getting any younger myself, we have to consider the message, don't let evil win in your community or in the world. Call it out. I couldn't agree more. And so I sing these songs ( privately in my car ! - if you heard my voice you would appreciate that ) and they become 4 dimensional. Cheers. I just spoke with people at the BOK Center. They said that the line starts with the first person in line at the time announced. Nobody with magic marker numbers will be allowed to skip ahead of whomever is there first, at the announced time. They are going to have a couple of members who are higher up in rank, from the venue, out and making sure things go smoothly. I repeatedly asked, "So the first person who is there at the proper time announced is the first person into the venue for GA?". I was told, "Yes. Nobody with a number on their wrist from whenever should be allowed to go in front. The person there at the correct time is the person who properly waited all day. No previous numbers will be honored.". I was told that those shapie numbers, already preassigned by whomever decides he or she is in charge, are not valid. If they show up and demand to be put in front-those who obeyeed the rules and starting lining up at the proper time should say, "No. We were here first as the rules clearly stated.:". There should be upper-tiered people about, along with security. If the sharpie numbered people start raising a fit-go get security. and ask for a supervisor if security does nothing. They will respond. I already let the venue know this is happening. They are now aware of it. I'm not going to this show. I feel so strongly about this that I had to do something. Whomever obeys the rules and is first should get into the venue first. The people at the BOK Center said, "Yes. That is the case.". You may have a disagreement on your hands. The rules are the rules. People who consider themselves above the rules love to kick and scream. It's my experience that when one does not back down...they stop kicking and quickly retreat. The BOK phone number is (918) 894-4200. If you are doing GA and worried about people skipping in line, call them. It will make them more aware. I warned them this was happening so they already have one. A coupld more would not hurt. Late to the party here, but I had to post because everyone in real life is tired of hearing me rave about SOE. I am IN LOVE with SOE, just wow. Totally agree that this is the best album since POP, which I never thought could be approached. Little Things might be a top favorite of all time, same with Red Flag Day and Landlady. Did I say Wow already? SOE also reinterprets and elevates SOI, in my humble opinion. I like SOI about a million times better now than I did three months ago. (I always felt a little weird listening to SOI, like I was reading someone's private diary. Almost too personal.) Those SOI B-sides though!!! I look forward to more SOE awesomeness here in the Zoo and then live this summer!! Cheers!